SFist has a pretty cool visualization of where San Francisco commuters are coming from. All those purple dots are why 101 gets so backed up in Marin. You can also see where the reverse commuters head back to when their work day is done. The stats are in for December so it’s time to look at the 2015 Marin housing market and how it compared to the years previous. The short answer is that the pattern continued: low inventory and rising prices. If anything, inventory levels were even lower than they had been, with last month having the fewest new listings and lowest months supply of inventory in years. In the chart below, the blue bars represent how many months it would take to sell the current supply of homes based on how quickly they are selling, and it’s down to less than a month for December, at the far right. That’s crazy low. It was a combination of very few new listings and an uncommonly high amount of sales closing for what is typically a quieter month. 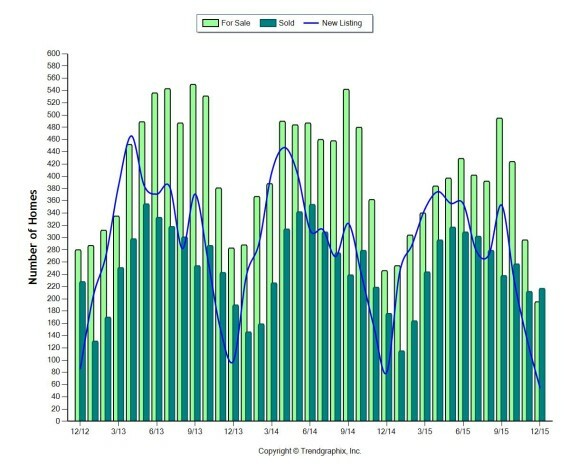 In this chart you can see the dark green bar, representing closed sales, is higher than the Decembers previous, while the blue line, which is new listings, is lower than for any month across the three year span of the chart. So basically, few new properties were coming on the market at the end of 2015 and buyers were snapping them up. 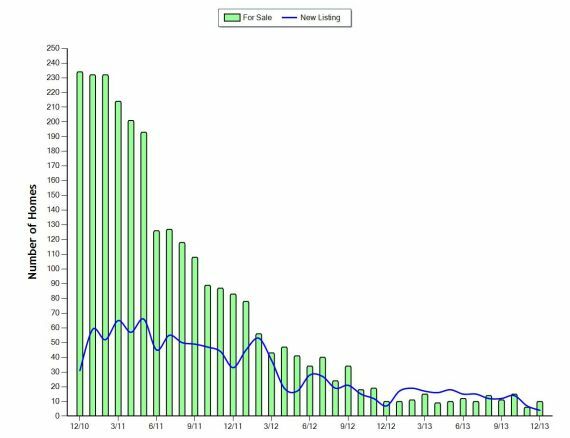 We’ve been waiting for a few years now for the floodgates to open and for more new listings to come on the market in Marin and it just hasn’t happened, while demand has remained extremely strong. As long as those dynamics remain prices will continue to increase as buyers are forced to compete for homes. There are a number of things that could change this picture, including rising interest rates, a correction in the tech sector in SF, or the stock market and economy in general.  With so many variables to watch it should be an interesting year ahead, and as always we’ll be here helping our clients navigate the complex Marin market. If you have questions about what’s happening in Marin or would like market info tailored to your price range or area feel free to drop me a line at george@sfnorth.com. Selling a home in areas served by the Ross Valley Sanitary District got a little more complicated as of January 1st. 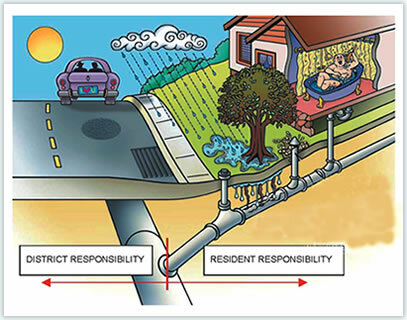 Thanks to the new Ordinance 66, when you list a property in Fairfax, Greenbrae, Kentfield, Larkspur, Ross, or San Anselmo you now will have to have a pressure test performed on the sewer lateral if the home is more than 20 years old or the lateral hasn’t been replaced in the last 20 years. Then if the line doesn’t pass the test it will have to be replaced, and as they are saying that pretty much any older sewer lateral will fail that test, basically it’s going to mean that everyone selling a home with an older line in the RVSD will need to replace it or negotiate with the buyer to take on that responsibility. This testing requirement is also triggered by any remodeling project that costs $75,000 or more or involves adding a bathroom. This is a big deal. Replacing a sewer lateral is often a $6,000 to $10,000 job, but can be more than that if it’s a long run or a complicated situation. And to make matters worse for some sellers, the ordinance also says that shared laterals are no longer acceptable, so if your property shares a line with a neighbor you will need to create a whole new lateral, which could get really messy if that means you need permission to dig up your neighbor’s yard and there is no easement in place. Sellers should keep in mind that RVSD has a lateral replacement grant program under which they will pay for half the cost of replacement up to $4,000, as long as money is available in the fund for the fiscal year. Since this new ordinance will mean a lot more people will be taking advantage of that program, it might be wise to get a jump on applying if you’re going to be selling a home with an older lateral and you’re considering just doing the work up front. While we applaud efforts to fix faulty sewer lines and think it’s an important health and environmental issue, we’re not fans of placing the burden on homeowners at the time they go to sell their property. There should be a better way to handle this than making it a point of sale requirement. As of this writing there is no info on Ordinance 66 on the RVSD website, which is a little surprising, but here is a link to the FAQ they have made available. We have a feeling you’ll be hearing a lot more about this issue in the coming months. Feel free to get in touch with us if you need advice about the best way to approach dealing with the issue when selling your home. In case you needed any more proof that the market in Mill Valley is super-heated due to tons of demand and limited inventory, here’s a great example. We knew 26 Shell Rd was going to get multiple offers and go well over asking, as it has an amazing lot and tons of potential. It’s on a big, sunny parcel, in the Alto Sutton Manor neighborhood that has become very hot the last few years, with good weather by MV standards, an awesome commute location, and the revamped Edna McGuire elementary school. The original homes in the area are modest, but many have been expanded or even completely rebuilt, and prices have been shooting up. This one has a dated but pleasant 1454 square foot home, a second bonus building, a pool, and lots of flat usable space. Asking was $1,100,00, which was an aggressive price, but it got 10 offers and closed recently for $1,603,000. Traditionally when you buy a house using a loan you get pre-approved by your banker or mortgage broker up front, based on some preliminary information about your financial profile, like credit scores, income and assets, and existing debt. Then once you get in contract on a home the lender underwrites the loan during the loan contingency period, typically a 10-17 day window after the offer is accepted. During that time the underwriter verifies employment and income, receives and reviews the appraisal, and gets other information and paperwork he needs so the bank can issue a firm approval. 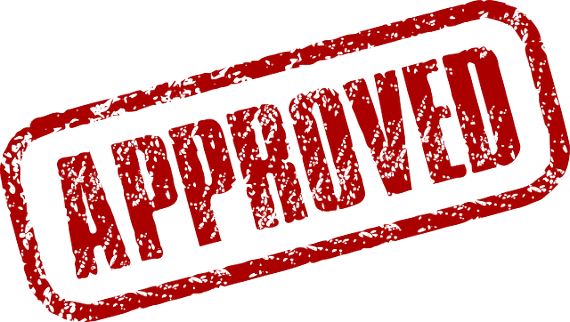 Once that approval is given then you can remove the contingency and proceed with the sale. But that waiting period puts you at a disadvantage when up against a cash buyer in a multiple offer situation. In extremely competitive markets like Marin County and San Francisco we’re seeing a new trend. In an effort to compete with cash buyers some home purchasers are getting full credit approval in advance, where their mortgage banker actually sends their file through underwriting up front, so the loan contingency can be shorter or even in some cases waived altogether. With cash buyers often coming out on top in multiple offer situations it’s natural for those using financing to look for ways to be more competitive, so this may become more and more common as the hot market continues. This more aggressive approach to financing brings up a couple of important questions. Is this method riskier than the traditional way of doing it, where a buyer has a contingency period during which she has an out if the financing doesn’t come together? And at some point will this become the new model for buyers getting loans? To this point this has been somewhat under the radar but the word is getting out, as the New York Times recently discussed the trend in a piece titled A New Weapon for Bidding Wars. Also, even if you have no loan contingency, offers with financing are traditionally written with an appraisal contingency. If the property appraises for less than the purchase price the buyer can cancel the contract. Buyers have the option of waiving that contingency, but the bank will only lend based on the appraised value. So buyers who are at the limit of the loan to value ratio (for example 80% in a typical situation) have to bring more down payment money to make the loan happen. But some buyers who have enough money down, or the flexibility to increase their down payment if needed, are going in with no loan or appraisal contingencies, and thus being basically the same as an all cash offer. That’s a huge advantage and we hear from one mortgage banker we work with a lot that the majority of the deals he’s doing lately in San Francisco are structured this way, and it’s becoming more common in Marin as well. It’s an interesting twist and the way things are going in this super competitive market it could become the new normal for many buyers. Considering you could forfeit your deposit if you make an offer with no contingencies and for some reason are unable to get financing, it’s not an approach to be taken lightly, and you need to be fully aware of all the risks before considering it. But if you’re writing offers in this crazy market it’s important to know that it’s happening, whether or not it’s an approach that would make sense for you. Kathleen Hilken from Coldwell Banker just brought on this new listing in San Anselmo and it’s one out favorites of the week. 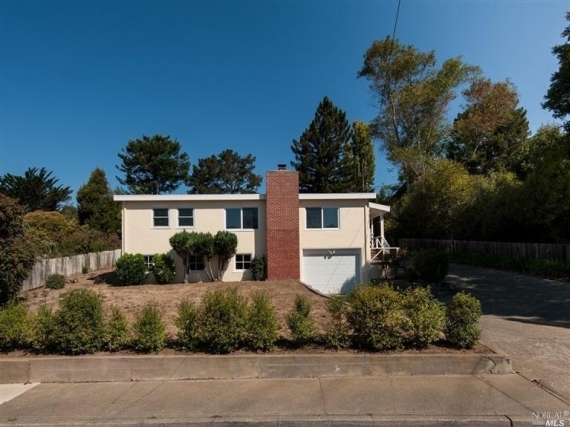 It’s a house that will fit what a lot of San Anselmo buyers are looking for, with charm, a nice yard, a good layout, great schools nearby, and in a neighborhood that everyone loves. Good homes have been scarce in the Morningside area of late (and San Anselmo in general), so at $1,049,000 it should get a lot of interest. How Much Income Do You Need to Buy a Home in the Bay Area? 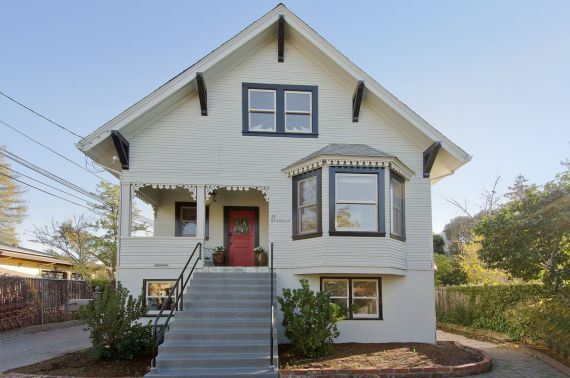 It’s not really news that prices are high in the Bay Area, but check out this column in SFGate to compare what you need to make to buy a home here with the situation in other cities around the country. These income figures are based on the median price for a home in the metro areas as a whole and don’t take into account taxes, insurance, and other costs (or down payment), but are still useful in looking at relative affordability between cities. Maybe not a list you really want to be at the top of, but the demand for homes in Marin and other areas around SF is off the charts. At least for now, they have just about completely dried up. We talked about this back in 2012 when they had slowed to a trickle, and that trend has continued. In December 2010 there were 31 new short sale listings in Marin, but last month that number was down to 4. There were a total of 10 active short sale listings, compared to the 234 on the market back in December 2010. Not that we should need distress sales to have any inventory in Marin, but this is certainly part of the story when looking for answers about this extended period of super low levels, as Janis Mara was doing in her recent IJ article. 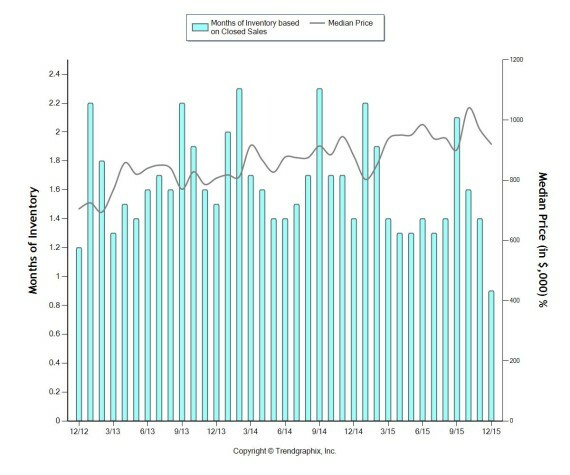 In this chart the green bars show total short sale inventory, while new short sale listings coming on each month are represented by the blue line. It makes sense that they are going away as prices rise enough so that owners are no longer underwater on their mortgages. The Consumer Finance Protection Bureau’s new rules for underwriting mortgages will start next week, and they will mean some buyers who qualified for a loan before will not meet the requirements under the new standards, especially those who were close to the debt-to-income ratio cutoff or those considering an adjustable rate loan. There will be lenders offering loans outside of the new guidelines, so we’ll have to see how it all shakes out, but this would be a good time to check in with your mortgage banker or loan broker if you were pre-approved last year. You can also find more info at the CFPB website. Stephen brought on a great new property this week. It’s a 3/2 Victorian home zoned for mixed use, plus a 2/1 apartment above the 3-car garage in back. The main house has period charm, including clawfoot tubs and beautiful wood details, and the location is amazing for those wanting to be near downtown. Open both Saturday and Sunday this weekend, 1-4. Asking price is $1,050,000.